Scientists and students in the Soltis Lab are currently working with a variety of technologies to investigate mechanisms of speciation, evolutionary relationships and character evolution in flowering and land plants at all taxonomic levels. Current projects include the study of higher level phylogenetic relationships and character evolution in the angiosperms, floral evolution, the genetic and genomic consequences of polyploidy, conservation genetics of rare plants, phylogeography, and biogeography. Please explore our website for more information on our research. Former lab member Richie Hodel was awarded the Florida Museum’s Austin Award for Research! Congrats Richie! A simplified example of how spike‐in standards can be used during read normalization to enable comparisons of expression level at different biological scales between a hypothetical diploid–polyploid pair with differing cell density. The large circles represent a unit of biomass and contain a number of cells (green squares). Beneath each circle is a depiction of how the read normalizations are calculated. Under a per transcriptome normalization, the ratio of target transcripts to the total transcriptome is compared. The per biomass normalization uses the ratio of the transcript of interest to the spike‐in transcripts. The per cell normalization also uses the ratio of the transcript of interest to spike‐in transcripts, but scales the spike‐in transcript abundance by cell density, represented here by multiplying the spike‐in abundance by the number of contributing cells. Whether the transcript of interest would be found as not differentially expressed (=) or upregulated (<) in the polyploid under each normalization is indicated (downregulated not included). DE: differential expression. Yao, G., J.-J. Jin, H.-T. Li, J.-B. Yang, V. Shiva Mandala, M. Croley, R. Mostow, N. A. Douglas, M. W. Chase, M. J. M. Christenhusz, D. E. Soltis, P. S. Soltis, S. A. Smith, S. F. Brockington, M. J. Moore, T.-S. Yi, and D.-Z. Li. 2019. 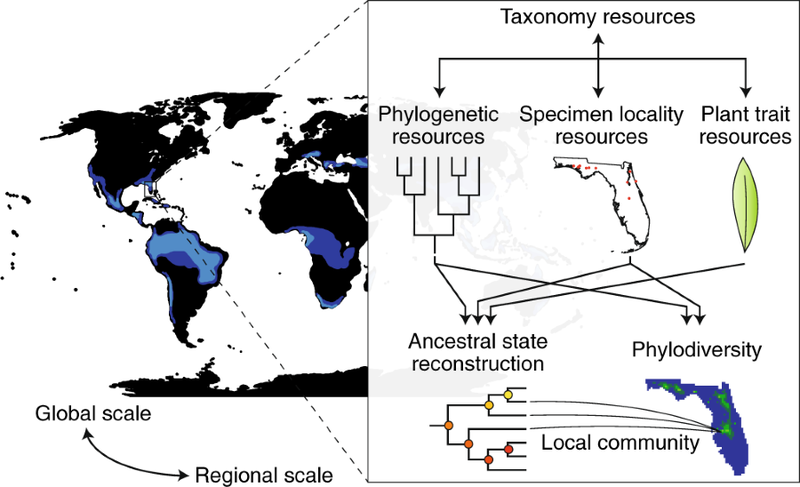 Plastid phylogenomic insights into the evolution of Caryophyllales. Molecular Phylogenetics and Evolution, doi: 10.1016/j.ympev.2018.12.023. Allen, J. M., C. C. Germain-Aubrey, N. Barve, K. M. Neubig, L. C. Majure, S. W. Laffan, B. D. Mishler, H. L. Owens, S. A. Smith, W. M. Whitten, J. R. Abbott, D. E. Soltis, R. Guralnick, and P. S. Soltis. 2018. 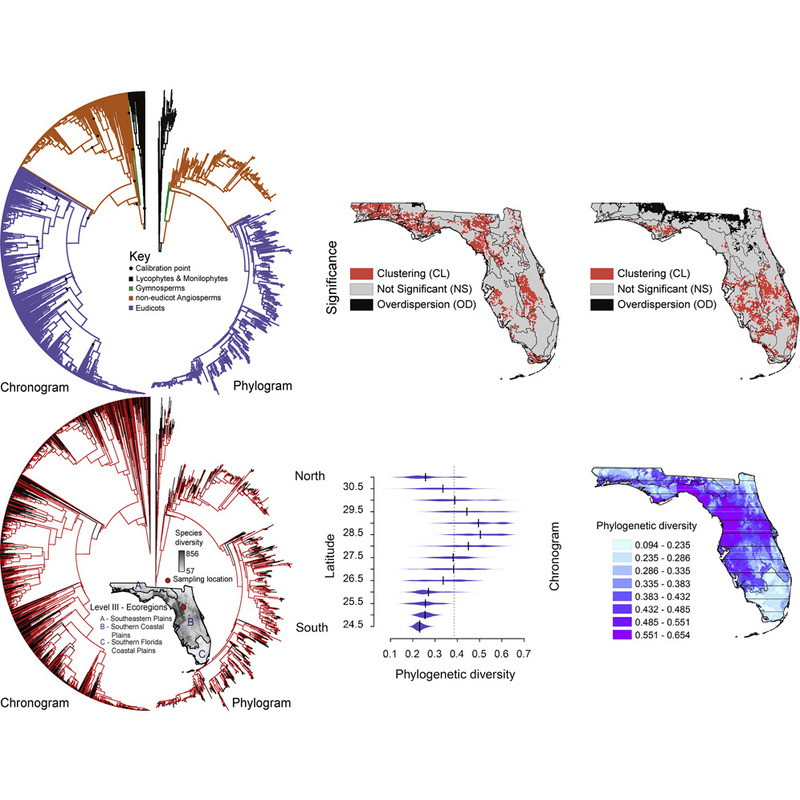 Spatial phylogenetics of Florida vascular plants: The effects of calibration and uncertainty on diversity estimates. iScience, doi: 10.1016/j.isci.2018.12.002.